More than four dozen firefighters extinguished a fire at a commercial building Sunday morning, and investigators are still working to determine the cause. Firefighters from Fire Districts 1 and 9 assisted, and no one was injured. Narrative:Sunday morning at 5:04 am two Spokane Fire Department (SFD) Engines were dispatched to an automatic fire alarm sounding at 1923 N Waterworks, The American Linen Company. The first SFD Company arrived within 2 minutes and immediately identified a working fire and upgraded the incident to a commercial response. 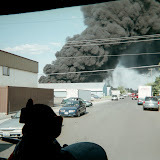 Heavy, black acrid smoke could be seen miles away as companies responding from all areas of the City of Spokane were called as the incident escalated to an eventual third alarm. Ultimately, the incident required all of the City's three ladder companies, heavy rescue, both Quint apparatus and more than 50 firefighters to control the blaze. The fire was declared extinguished at 7:14 am, more than two hours after being discovered. The 56,000-square-foot commercial building sustained heavy damage to the exterior, address side of the building as well as numerous areas in the roof/ceiling throughout the industrial sections of the building. Sound tactics and capable resources were able to stop the travel of fire to office areas and other critically functional sections of the building. Cause:The cause is under investigation by the Fire Department's Investigation Unit. Through interviews and examination of the fire damage, preliminary information indicates that the fire started on the exterior of the building in large bins of textile materials likely laden with oil residue. A fire sprinkler system was activated, however the fire load present overwhelmed the system's capacity and the fire grew rapidly into the vertical space above. A more precise cause and origin explanation is being developed and will likely be released this afternoon/evening. Damage:No injuries are reported. Monetary damage is being calculated by the SIU in coordination with insurance and company representatives, and will likely not be available for several days.